In previous posts we have seen – and critiqued – ideas about the causes of ice age inception and ice age termination being due to high latitude insolation. These ideas are known under the banner of “Milankovitch forcing”. 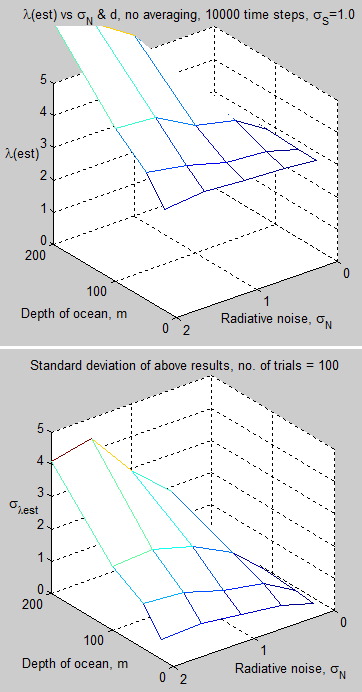 Mostly I’ve presented the concept by plotting insolation data at particular latitudes, in one form or another. The insolation at different latitudes depends on obliquity and precession (as well as eccentricity). Obliquity is the tilt of the earth’s axis – which varies over about 40,000 year cycles. Precession is the movement of point of closest approach (perihelion) and how it coincides with northern hemisphere summer – this varies over about a 20,000 year cycle. The effect of precession is modified by the eccentricity of the earth’s axis – which varies over a 100,000 year cycle. If the earth’s orbit was a perfect circle (eccentricity = 0) then “precession” would have no effect, because the earth would be a constant distance from the sun. As eccentricity increases the impact of precession gets bigger. How to understand these ideas better? Peter Huybers has a nice explanation and presentation of obliquity and precession in his 2007 paper, along with some very interesting ideas that we will follow up in a later article. We can see immediately that times of maximum precession (bottom graph) have very little impact on annual averages (the right side graph). This is because the increase in, say, the summer/autumn, are cancelled out by the corresponding decreases in the spring. But we can also see that times of maximum obliquity (middle graph) DO impact on annual averages (right side graph). Total energy is shifted to the poles from the tropics . I was trying, not very effectively, to explain some of this in (too many graphs) in Part Five – Obliquity & Precession Changes. 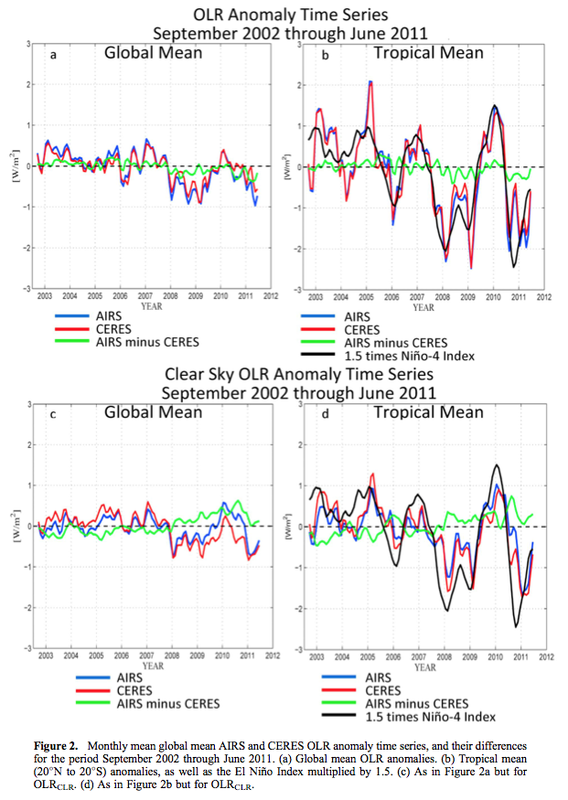 It is easy to see that the 40,000 year obliquity cycles correspond to high latitude (north & south) anomalies, which last for considerable periods. When obliquity is high, the northern and southern high latitude regions have an increase in annual average insolation. When obliquity is low, there is a decrease. If we look at the precession we don’t see a corresponding change in the annual average (because one season’s increase mostly cancels out the other season’s decrease). Huybers’ paper has a lot more to it than that, and I recommend reading it. 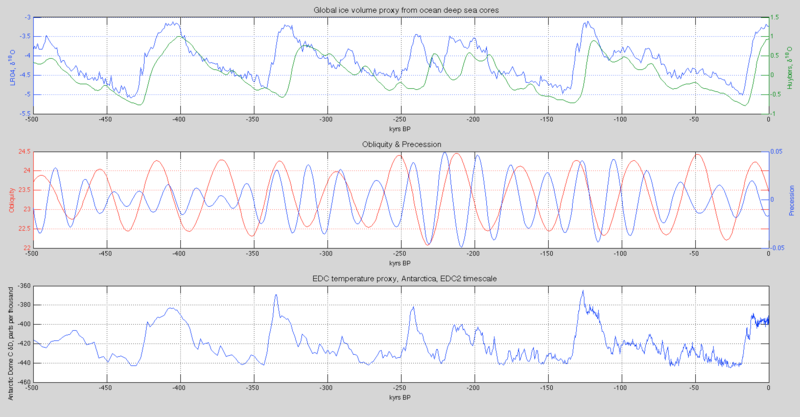 He has a 2M yr global proxy database, that isn’t dependent on “orbital tuning” (note 1) and an interesting explanation and demonstration for obliquity as the dominant factor in “pacing” the ice ages. We will come back to his ideas. In the meantime, I’ve been collecting various data sources. One big challenge in understanding ice ages is that the graphs in the various papers don’t allow you to zoom in on the period of interest. I thought I could help to fix that by providing the data – and comparing the data – in High Definition instead of snapshots of 800,000 years on half the width of a standard pdf. It’s a work in progress.. The middle graph has CO2 and CH4 from Dome C. It’s amazing how tightly CO2 and CH4 are linked to the temperature proxies and to each other. (The CO2 data comes from Lüthi et al 2008, and the CH4 data from Loulergue et al 2008). 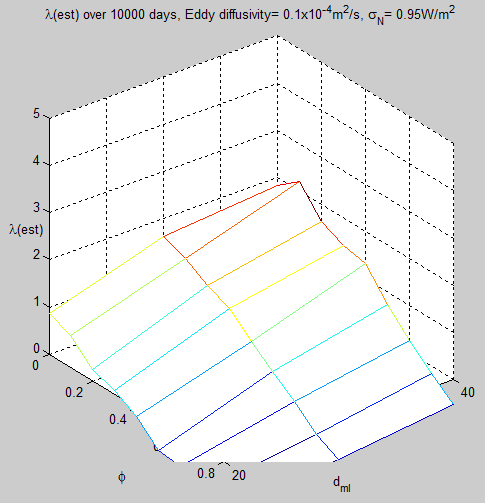 The bottom graph has obliquity and annual insolation anomaly area-averaged over 70ºS-90ºS. Because we are looking at annual insolation anomaly this value is completely in phase with obliquity. Why are the two datasets on the top graph out of alignment? I don’t know the full answer to this yet. Obviously the lag from the atmosphere to the deep ocean is part of the explanation. As most papers acknowledge, providing data on the most accurate “assumption free” timescales is the Holy Grail of ice age analysis. However, there are no assumption-free timescales. But lots of progress has been made. Huybers’ timescale is based primarily on a) a sedimentation model, b) tying together the various identified inception & termination points for each of the proxies, c) the independently dated Brunhes- Matuyama reversal at 780,000 years ago. EDC2 was the timescale on which the data was presented in the seminal 2004 EPICA paper. This 2004 paper presented the EDC core going back over 800 kyrs (previously the Vostok core was the longest, going back 400 kyrs). 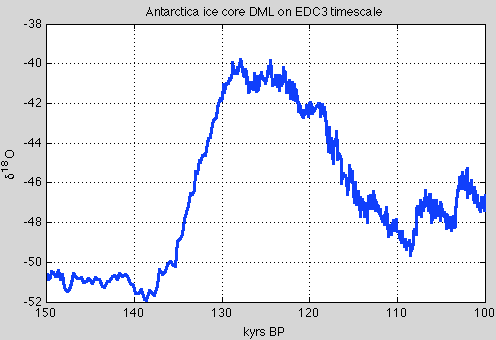 The EPICA 2006 paper was the Dronning Maud Land Core (EDML) which covered a shorter time (150 kyrs) but at higher resolution, allowing a better matchup between Antarctica and Greenland. This introduced the improved EDC3 timescale. In a technical paper on dating, Parannin et al 2007 show the differences between EDC3 and EDC2 and also between EDC3 and LR04. So if you have data, you need to understand the timescale it is plotted on. 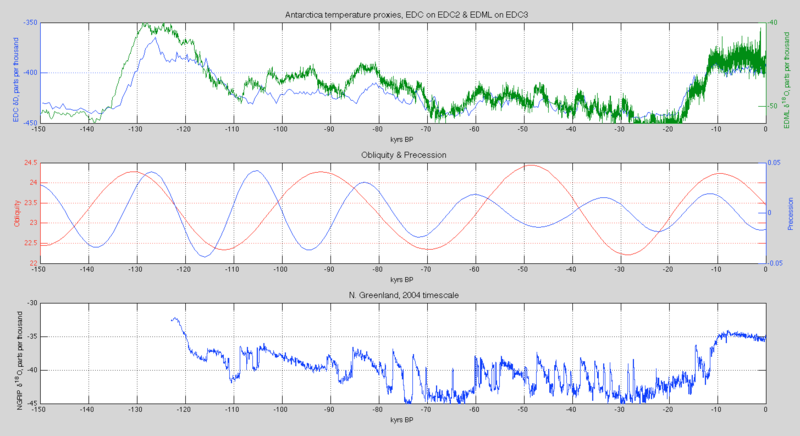 I have the EDC3 timescale in terms of depth so next I’ll convert the EDC temperature proxy (δD) on EDC2 to EDC3 time. 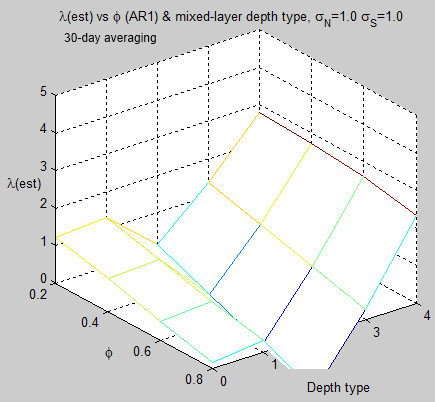 I also have dust vs depth for the EDC core – another fascinating variable that is about 25 times stronger during peak glacials compared with interglacials – this needs converting to the EDC3 timescale. Other data includes some other atmospheric chemical components. Then I have NGRIP data (North Greenland) going back 123,000 years but on the original 2004 timescale, and it has been relaid onto GICC05 timescale (still to find). Very recently (mid 2013) a new Antarctic timescale was proposed – AICC2012 – which brings all of the Antarctic ice cores onto one common timescale. See references below. Calling Matlab gurus – plotting many items onto one graph has some benefits. 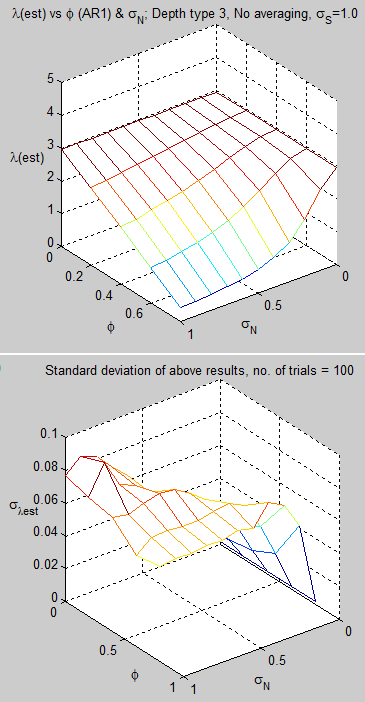 Matlab is an excellent tool but I haven’t yet figured out how to plot lots of data onto the same graph. If multiple data sources have the same x-series data and a similar y-range there is no problem. If I have two data sources with similar x values (but different x-series data) and completely different y values I can use plotyy. How about if I have five datasources, each with different but similar x-series and different y-values. How do I plot them on one graph, and display the multiple y-axes (easily)? This article was intended to highlight obliquity and precession in a different and hopefully more useful way. And to begin to present some data in high resolution. Note 1 – See for example Thirteen – Terminator II, under the heading What is the basis for the SPECMAP dating? It is important to understand the assumptions built into every ice age database. Huybers 2007 continues the work of HW04 (Huybers & Wunsch 2004) which attempts to produce a global proxy datbase (a proxy for global ice volume) without any assumptions relating to the “Milankovitch theory”. What is the basis for the SPECMAP dating? The ice age records that have been most used and best known come from ocean sediments. These were the first long-dated climate records that went back hundreds of thousands of years. How do they work and what do they measure? Oxygen exists in the form of a few different stable isotopes. The most common is 16O with 18O the next most common, but much smaller in proportion. Water, aka H2O, also exists with both these isotopes and has the handy behavior of evaporating and precipitating H218O water at different rates to H216O. The measurement is expressed as the ratio (the delta, or δ) as δ18O in parts per thousand. The journey of water vapor evaporating from the ocean, followed by precipitation, produces a measure of the starting ratio of the isotopes as well as the local precipitation temperature. The complex end result of these different process rates is that deep sea benthic foraminifera take up 18O out of the deep ocean, and the δ18O ratio is mostly in proportion to the global ice volume. 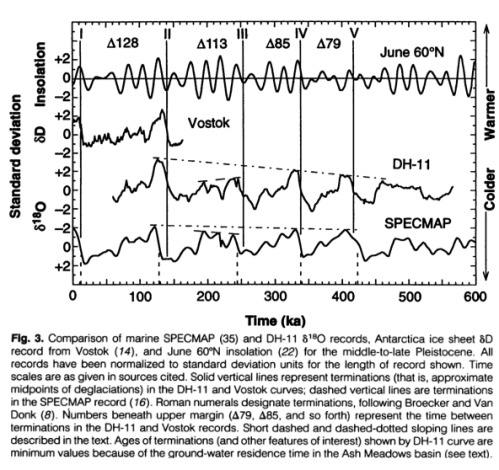 The resulting deep sea sediments are therefore a time-series record of ice volume. However, sedimentation rates are not an exact science and are not necessarily constant in time. As a result of lots of careful work by innumerable people over many decades, out popped a paper by Hays, Imbrie & Shackleton in 1976. This demonstrated that a lot of the recorded changes in ice volume happened at orbital frequencies of precession and obliquity (approximately every 20kyrs and every 40 kyrs). But there was an even stronger signal – the start and end of ice ages – at approximately every 100 kyrs. This coincides roughly with changes in eccentricity of the earth’s orbit, not that anyone has a (viable) theory that links this change to the start and end of ice ages. Now the clear signal of obliquity and precession in the record gives us the option of “tuning up” the record so that peaks in the record match orbital frequencies of precession and obliquity. We discussed the method of tuning in some past comments on a similar, but much later, dataset – the LR04 stack (thanks to Clive Best for highlighting it). The method isn’t wrong, but we can’t confirm the timing of key events with a dataset where dates have been tuned to a specific theory. Luckily, some new methods have come along. It’s been exciting times for the last twenty plus years in climate science for people who want to wear thick warm clothing and “get away from it all”. Greenland and Antarctica have yielded a number of ice cores. Greenland now has a record that goes back 123,000 years (NGRIP). Antarctica now has a record that goes back 800,000 years (EDC, aka, “Dome C”). Antarctica also has the Voskok ice core that goes back about 400,000 years, Dome Fuji that goes back 340,000 years and Dronning Maud Land (aka DML or EDML) which is higher resolution but only goes back 150,000 years. What do these ice cores measure and how is the dating done? The ice cores measure temperature at time of snow deposition via the δ18O measurement discussed above (note 2), which in this case is not a measure of global ice volume but of air temperature. The gas trapped in bubbles in the ice cores gives us CO2 and CH4 concentrations. We also can measure dust deposition and all kinds of other goodies. The first problem is that the gas is “younger” than the ice because it moves around until the snow compacts enough. So we need a model to calculate this, and there is some uncertainty about the difference in age between the ice and the gas. The second problem is how to work out the ice age. At the start we can count annual layers. After sufficient time (a few tens of thousands of years) these layers can’t be distinguished any more, instead we can use models of ice flow physics. 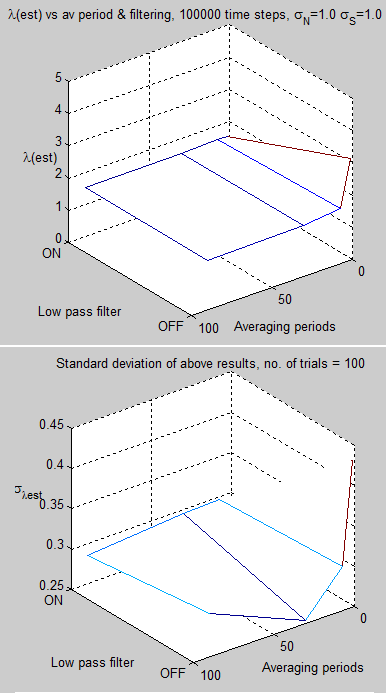 Then a few handy constraints arrive like 10Be events that occurred about 50 kyrs BP. 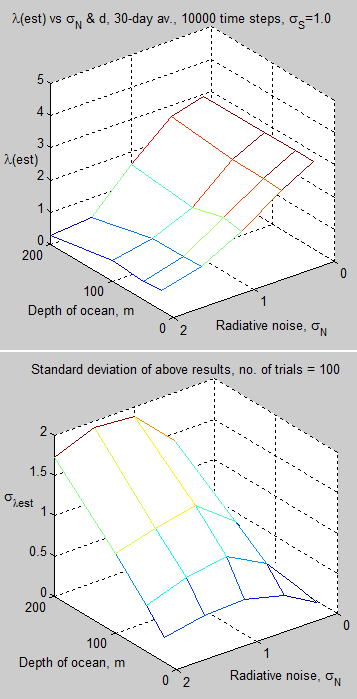 After ice flow physics and external events are exhausted, the data is constrained by “orbital tuning”, as with deep ocean cores. Neither deep sea cores, nor ice cores, give us much possibility of radiometric dating. But caves and corals do. For newcomers to dating methods, if you have substance A that decays into substance B with a “half-life” that is accurately known, and you know exactly how much of substance A and B was there at the start (e.g. no possibility of additional amounts of A or B getting into the thing we want to measure) then you can very accurately calculate the age that the substance was formed. Basically it’s all down to how to deposition process works. Uranium-Thorium dating has been successfully used to date calcite depositions in rock. For people interested in more detail, I recommend McDermott 2004, some relevant extracts below in note 3). Corals offer the possibility, via radiometric dating, of getting accurate dates of sea level. The most important variable to know is any depression and uplift of the earth’s crust. Accurate dating of caves and coral has been a growth industry in the last twenty years with some interesting results. The Devils Hole δ18O time curve (fig 2) clearly displays the sawtooth pattern characteristic of marine δ18O records that have been interpreted to be the result of the waxing and waning of Northern Hemisphere ice sheets.. But what caused the δ18O variations in DH-11 shown on fig. 2? ..The δ18O variations in atmospheric precipitation are – to a first approximation – believed to reflect changes in average winter-spring surface temperature.. Termination II occurs at 140±3 (2σ) ka in the DH-11 record, at 140± 15 ka in the Vostok record (14), and at 128 ± 3 ka in the SPECMAP record (13). (The uncertainty in the DH-11 record is in the 2σ uncertainties on the MS uranium-series dates; other dates and uncertainties are from the sources cited.) Termination III occurred at about 253 +/- 3 (2σ) ka in the DH11 record and at about 244 +/- 3 ka in the SPECMAP record. These differences.. are minimum values..
Of course, not everyone was happy with this new information, and who knows what the isotope measurement really was a proxy for? Our dates imply a timing and duration for substage 5e in substantial agreement with the orbitally tunes marine chronology. Initial direct U-Th dating of the marine δ18O record supports the theory that orbital variations are a fundamental cause of Pleistocene climate change. [Emphasis added, likewise with all quotes]. Milankovitch proposed that summer insolation at mid-latitudes in the Northern Hemisphere directly causes the ice-age climate cycles. This would imply that times of ice-sheet collapse should correspond to peaks in Northern Hemisphere June insolation. But the penultimate deglaciation has proved controversial because June insolation peaks 127 kyr ago whereas several records of past climate suggest that change may have occurred up to 15kyr earlier. 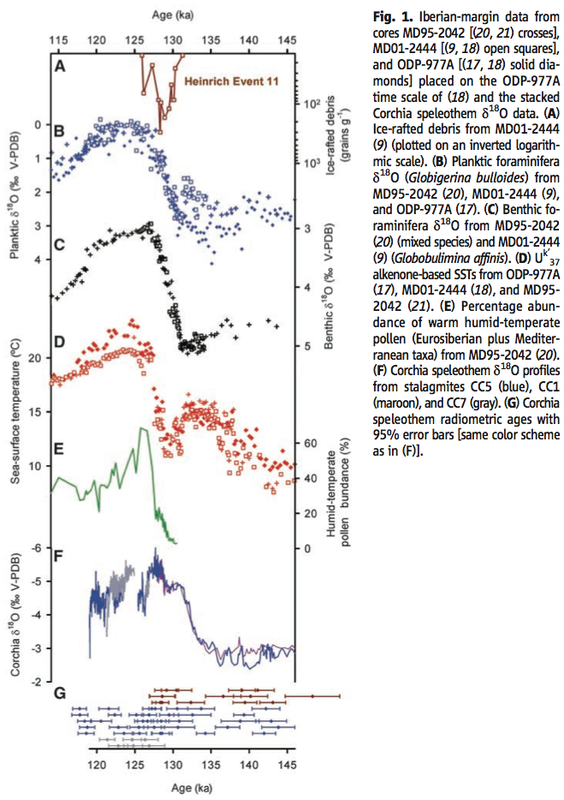 There is a clear signature of the penultimate deglaciation in marine oxygen-isotope records. But dating this event, which is significantly before the 14C age range, has not been possible. Here we date the penultimate deglaciation in a record from the Bahamas using a new U-Th isochron technique. After the necessary corrections for a-recoil mobility of 234U and 230Th and a small age correction for sediment mixing, the midpoint age for the penultimate deglaciation is determined to be 135 +/-2.5 kyr ago. This age is consistent with some coral-based sea-level estimates, but it is difficult to reconcile with June Northern Hemisphere insolation as the trigger for the ice-age cycles. High-precision 230Th- 238U ages for a stalagmite from Newdegate Cave in southern Tasmania, Australia.. The fastest stalagmite growth occurred between 129.2 ± 1.6 and 122.1 ± 2.0 ka (61.5 mm/ka), coinciding with a time of prolific coral growth from Western Australia (128-122 ka). This is the first high-resolution continental record in the Southern Hemisphere that can be compared and correlated with the marine record. Such correlation shows that in southern Australia the onset of full interglacial sea level and the initiation of highest precipitation on land were synchronous. The stalagmite growth rate between 129.2 and 142.2 ka (5.9 mm/ka) was lower than that between 142.2 and 154.5 ka (18.7 mm/ka), implying drier conditions during the Penultimate Deglaciation, despite rising temperature and sea level. This asymmetrical precipitation pattern is caused by latitudinal movement of subtropical highs and an associated Westerly circulation, in response to a changing Equator-to-Pole temperature gradient. Both marine and continental records in Australia strongly suggest that the insolation maximum between 126 and 128 ka at 65°N was directly responsible for the maintenance of full Last Interglacial conditions, although the triggers that initiated Penultimate Deglaciation (at 142 ka) remain unsolved. An outcrop within the last interglacial terrace on Barbados contains corals that grew during the penultimate deglaciation, or Termination II. We used combined 230Th and 231Pa dating to determine that they grew 135.8 ± 0.8 thousand years ago, indicating that sea level was 18 ± 3 meters below present sea level at the time. This suggests that sea level had risen to within 20% of its peak last- interglacial value by 136 thousand years ago, in conflict with Milankovitch theory predictions.. 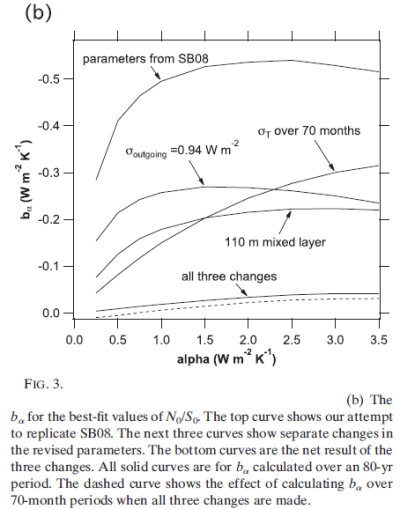 Figure 2B summarizes the sea level record suggested by the new data. 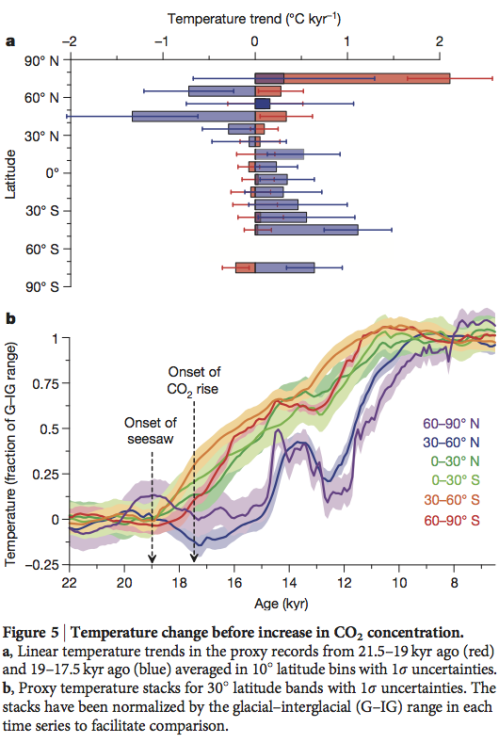 Most significantly our record includes corals that document sea level directly during Termination II, suggesting that the majority (~80%) of the Termination II sea level rise occurred before 135 ka. 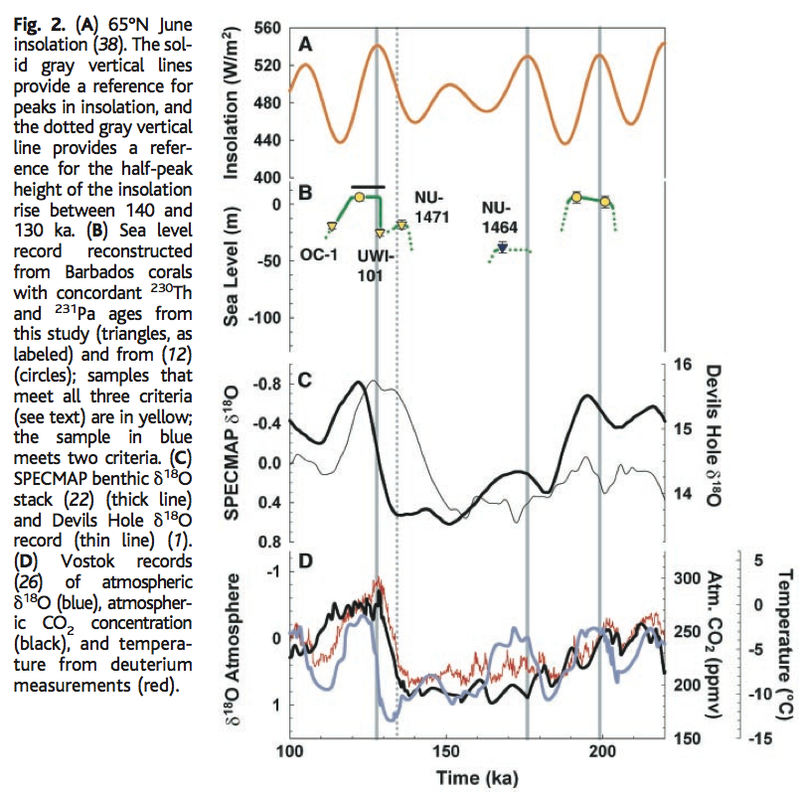 This is broadly consistent with early shifts in δ18O recorded in the Bahamas and Devils Hole and with early dates (134 ka) of last interglacial corals from Hawaii, which call into question the timing of Termination II in the SPECMAP record.. ..The Milankovitch theory in its simplest form cannot explain Termination II, as it does Termination I. However, it is still plausible that insolation forcing played a role in the timing of Termination II. As deglaciations must begin while Earth is in a glacial state, it is useful to look at factors that could trigger deglaciation during a glacial maximum. These include – (i) sea ice cutting off a moisture source for the ice sheets; – (ii) isostatic depression of continental crust; and – (iii) high Southern Hemisphere summer insolation through effects on the atmospheric CO concentration. Thorium-230 ages and oxygen isotope ratios of stalagmites from Dongge Cave, China, characterize the Asian Monsoon and low-latitude precipitation over the past 160,000 years. 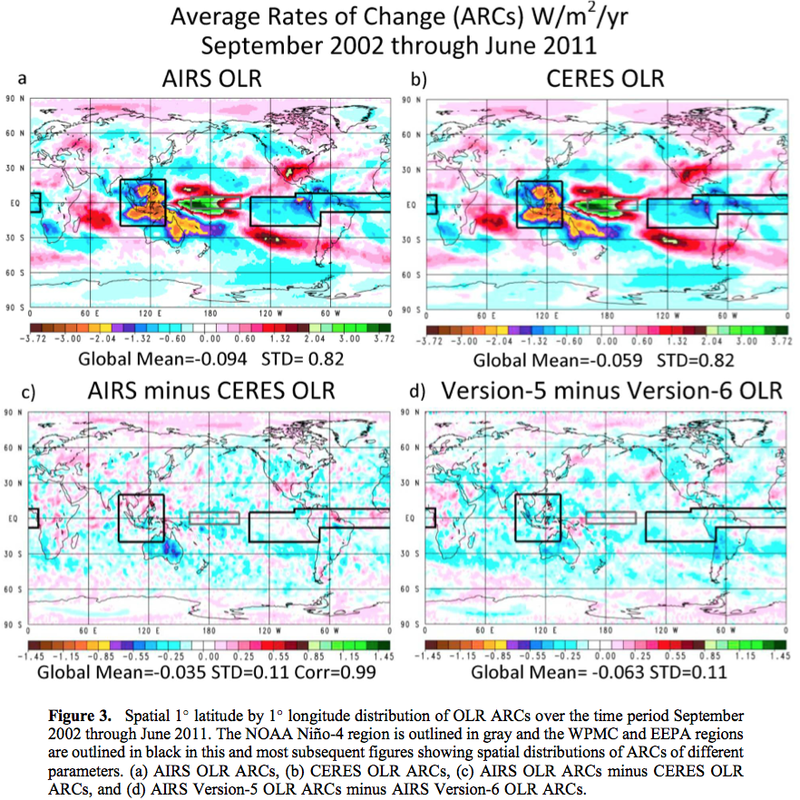 Numerous abrupt changes in 18O/16O values result from changes in tropical and subtropical precipitation driven by insolation and millennial-scale circulation shifts. The Last Interglacial Monsoon lasted 9.7 +/- 1.1 thousand years, beginning with an abrupt (less than 200 years) drop in 18O/16O values 129.3 ± 0.9 thousand years ago and ending with an abrupt (less than 300 years) rise in 18O/16O values 119.6 ± 0.6 thousand years ago. The start coincides with insolation rise and measures of full interglacial conditions, indicating that insolation triggered the final rise to full interglacial conditions. Although the timing of Monsoon Termination II is consistent with Northern Hemisphere insolation forcing, not all evidence of climate change at about this time is consistent with such a mechanism (Fig. 3). Sea level apparently rose to levels as high as –21 m as early as 135 ky before the present (27 & Gallup et al 2002), preceding most of the insolation rise. 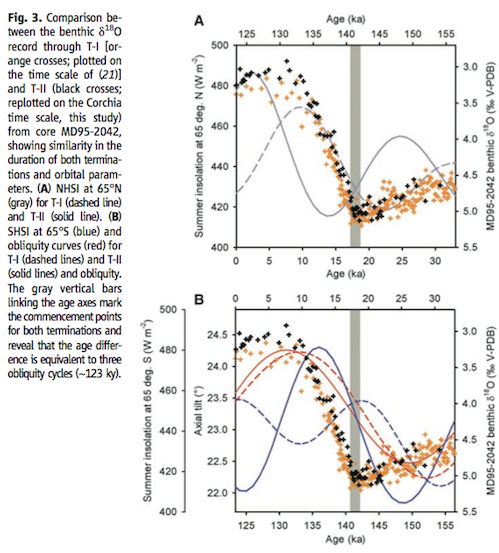 The half-height of marine oxygen isotope Termination II has been dated at 135 +/- 2.5 ky (Henderson & Slowey 2000). Speleothem evidence from the Alps indicates temperatures near present values at 135 +/- 1.2 ky (31). The half-height of the d18O rise at Devils Hole (142 +/- 3 ky) also precedes most of the insolation rise (20). Increases in Antarctic temperature and atmospheric CO2 (32) at about the time of Termination II appear to have started at times ranging from a few to several millennia before most of the insolation rise (4, 32, 33). Variations in the intensity of high-latitude Northern Hemisphere summer insolation, driven largely by precession of the equinoxes, are widely thought to control the timing of Late Pleistocene glacial terminations. However, recently it has been suggested that changes in Earth’s obliquity may be a more important mechanism. We present a new speleothem-based North Atlantic marine chronology that shows that the penultimate glacial termination (Termination II) commenced 141,000 ± 2,500 years before the present, too early to be explained by Northern Hemisphere summer insolation but consistent with changes in Earth’s obliquity. Our record reveals that Terminations I and II are separated by three obliquity cycles and that they started at near-identical obliquity phases. Standard stuff by now, for readers who have made it this far. But the Drysdale paper is interesting on two fronts – their dating method and their “one result in a row” matching a theory with evidence (I extracted more text from the paper in note 5 for interested readers). Let’s look at the dating method first. Basically what they did was match up the deep ocean cores that record global ice volume (but have no independent dating) with accurately radiometrically-dated speleothems (cave depositions). How did they do the match up? It’s complicated but relies on the match between the δ18O in both records. The approach of providing absolute dating for existing deep ocean cores will give very interesting results if it proves itself. The correspondence between Corchia δ18O and Iberian-margin sea-surface temperatures (SSTs) through T-II (Fig. 2) is remarkable. Although the mechanisms that force speleothem δ18O variations are complex, we believe that Corchia δ18O is driven largely by variations in rainfall amount in response to changes in regional SSTs. Previous studies from Corchia show that speleothem δ18O is sensitive to past changes in North Atlantic circulation at both orbital and millennial time scales, with δ18O increasing during colder (glacial or stadial) phases and the reverse occurring during warmer (inter- glacial or interstadial) phases. We find that NHSI [NH summer insolation] intensity is unlikely to be the driving force for T-II: Intensity values are close to minimum at the time of the start of T-II, and a lagged response to the previous insolation peak at ~148 ka is unlikely because of its low amplitude (Fig. 3A). This argues against the SPECMAP curve being a reliable age template through T-II, given the age offset of ~8 ky for the T-II midpoint (8) with respect to our record. A much stronger case can be made for obliquity as a forcing mechanism. 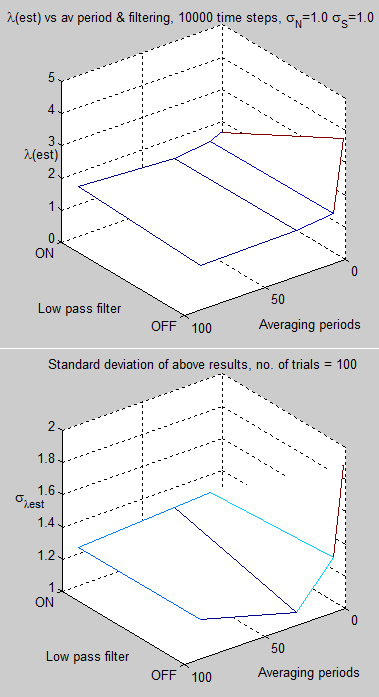 On the basis of our results (Fig. 3B), both T-I and T-II commence at the same phase of obliquity, and the period between them is exactly equivalent to three obliquity cycles (~123 ky). (More of their explanation in note 5). The many Antarctic and Greenland ice cores are still undergoing revisions of dating, and so I haven’t attempted to get the latest work. I just thought it would be good to throw in an ice core. The value of δ18O here is a proxy for local temperature. On this timescale local temperatures began rising about 138 kyrs BP. New data on Termination II from the last 20 years of radiometric dating from a number of different sites with different approaches demonstrate that TII started about 140 kyrs BP. It’s proven that ice ages are terminated by low solar insolation in the high latitudes of the northern hemisphere. The basis for this is that the low solar insolation allows a much quicker build up of the northern hemisphere ice sheets, causing dynamic instability, leading to ice sheet calving, which disrupts ocean currents, outgassing CO2 in large concentrations and thereby creating a positive feedback for temperature rise. The local ice sheet collapses also create positive feedback due to higher solar insolation now absorbed. As the ice sheets continue to melt, the (finally) rising solar insolation in high northern latitudes strengthens the pre-existing conditions and helps to establish the termination. Thus the orbital theory is given strong support from the evidence of the timing of the last two terminations. I just made that up in a few minutes for fun. It’s not true. 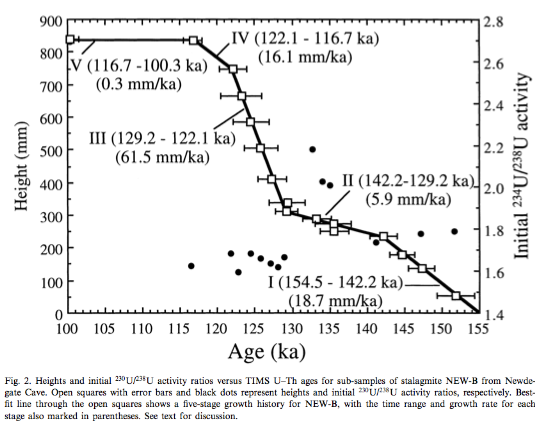 We saw one paper with different evidence for the start of TII – Yuan et al (and see note 6). However, it seems that most lines of evidence, including absolute dating of sea level rise puts TII starting around 140 kyrs BP. This also means, for maths wizards, that the time between ice age terminations, from one result in a row, is about 122 kyrs. This puts the time between TIII and TII at about 113 kyrs which is exactly the time of five precessional cycles! I haven’t yet dug into any other dates for TIII so this theory is quite preliminary. Note 1 – In common ice age convention, the date of a termination is the midpoint of the sea level rise from the last glacial maximum to the peak interglacial condition. This can be confusing for newcomers. Note 2 – The alternative method used on some of the ice cores is δD, which works on the same basis – water with the hydrogen isotope Deuterium evaporates and condenses at different rates to “regular” water. (ii) in arid/semi- arid regions, evaporative processes that modify d18Op at the surface prior to infiltration and in the upper part of the vadose zone. The present-day pattern of spatial and seasonal variations in d18Op is well documented (Rozanski et al., 1982, 1993; Gat, 1996) and is a consequence of several so-called ‘‘effects’’ (e.g. latitude, altitude, distance from the sea, amount of precipitation, surface air temperature). (v) the so-called ‘‘amount’’ effect. 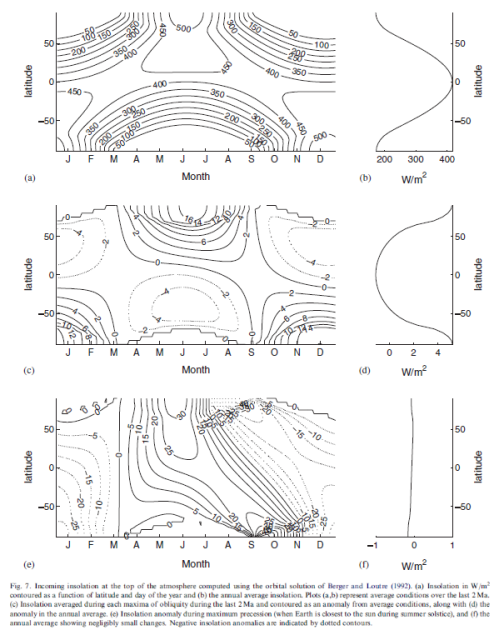 As a result of these ambiguities there has been a shift from the expectation that speleothem d18Oct might provide quantitative temperature estimates to the more attainable goal of providing precise chronological control on the timing of major first-order shifts in d18Op, that can be interpreted in terms of changes in atmospheric circulation patterns (e.g. 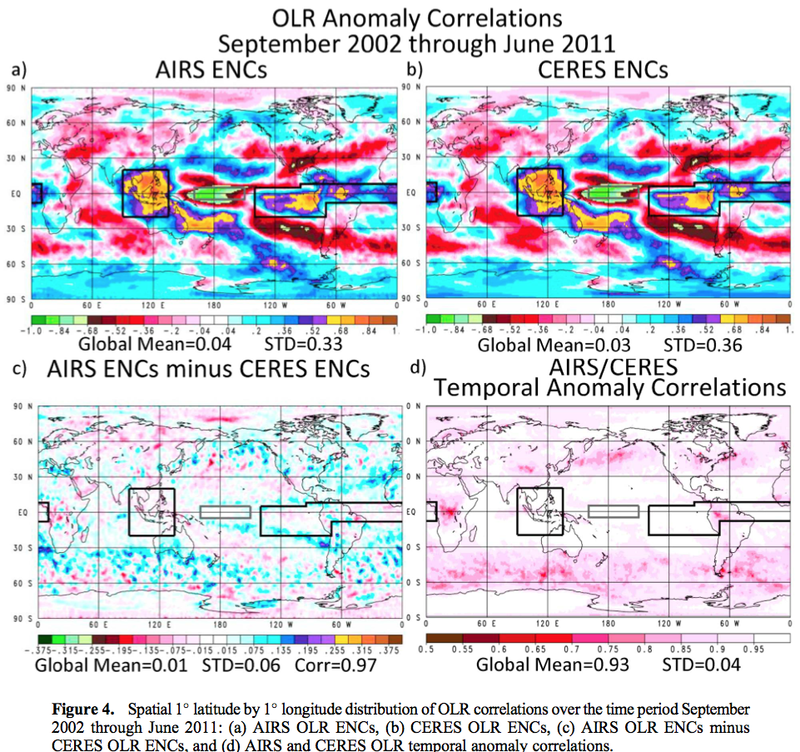 Burns et al., 2001; McDermott et al., 2001; Wang et al., 2001), changes in the d18O of oceanic vapour sources (e.g. 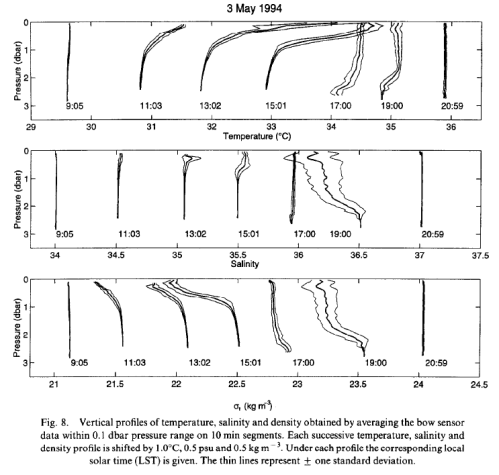 Bar Matthews et al., 1999) or first-order climate changes such as D/O events during the last glacial (e.g. Spo.tl and Mangini, 2002; Genty et al., 2003)..
Speleothem records from Late Pleistocene mid- to high-latitude sites are discussed first, because these are likely to be sensitive to glacial–interglacial transitions, and they illustrate an important feature of speleothems, namely that calcite deposition slows down or ceases during glacials. Fig. 1 is a compilation of approximately 750 TIMS U-series speleothem dates that have been published during the past decade, plotted against the latitude of the relevant cave site. The absence of speleothem deposition in the mid- to high latitudes of the Northern Hemisphere during isotope stage 2 is striking, consistent with results from previous compilations based on less precise alpha-spectrometric dates (e.g. Gordon et al., 1989; Baker et al., 1993; Hercmann, 2000). By contrast, speleothem deposition appears to have been essentially continuous through the glacial periods at lower latitudes in the Northern Hemisphere (Fig. 1)..
..A comparison of the DH-11 [Devils Hole] record with the Vostok (Antarctica) ice-core deuterium record and the SPEC- MAP record that largely reflects Northern Hemisphere ice volume (Fig. 2) indicates that both clearly record the first-order glacial–interglacial transitions. Note 4 – Note the reference to Milankovitch theory “explaining” Termination I. This appears to be the point that insolation was at least rising as Termination began, rather than falling. It’s not demonstrated or proven in any way in the paper that Termination I was caused by high latitude northern insolation, it is an illustration of the way the “widely-accepted point of view” usually gets a thumbs up. You can see the same point in the quotation from the Zhao paper. It’s the case with almost every paper. If it’s impossible to disprove a theory with any counter evidence then it fails the test of being a theory. During the Late Pleistocene, the period of glacial-to-interglacial transitions (or terminations) has increased relative to the Early Pleistocene [~100 thousand years (ky) versus 40 ky]. A coherent explanation for this shift still eludes paleoclimatologists. Although many different models have been proposed, the most widely accepted one invokes changes in the intensity of high-latitude Northern Hemisphere summer insolation (NHSI). These changes are driven largely by the precession of the equinoxes, which produces relatively large seasonal and hemispheric insolation intensity anomalies as the month of perihelion shifts through its ~23-ky cycle. Recently, a convincing case has been made for obliquity control of Late Pleistocene terminations, which is a feasible hypothesis because of the relatively large and persistent increases in total summer energy reaching the high latitudes of both hemispheres during times of maximum Earth tilt. Indeed, the obliquity period has been found to be an important spectral component in methane (CH4) and paleotemperature records from Antarctic ice cores. Testing the obliquity and other orbital-forcing models requires precise chronologies through terminations, which are best recorded by oxygen isotope ratios of benthic foraminifera (d18Ob) in deep-sea sediments (1, 8). Although affected by deep-water temperature (Tdw) and composition (d18Odw) variations triggered by changes in circulation patterns (9), d18Ob signatures remain the most robust measure of global ice-volume changes through terminations. Unfortunately, dating of marine sediment records beyond the limits of radiocarbon methods has long proved difficult, and only Termination I [T-I, ~18 to 9 thousand years ago (ka)] has a reliable independent chronology. Most marine chronologies for earlier terminations rely on the SPECMAP orbital template (8) with its a priori assumptions of insolation forcing and built-in phase lags between orbital trigger and ice-sheet response. 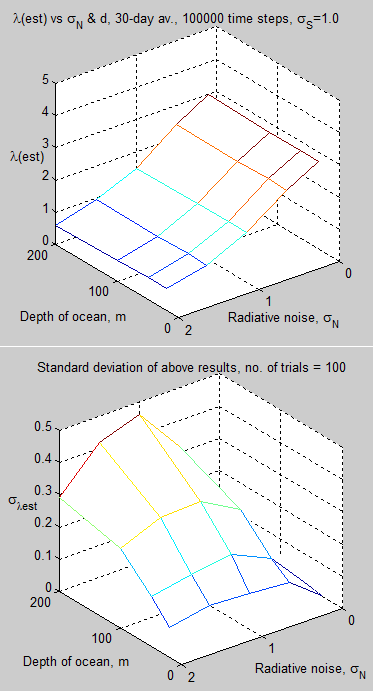 Although SPECMAP and other orbital-based age models serve many important purposes in paleoceanography, their ability to test climate- forcing hypotheses is limited because they are not independent of the hypotheses being tested. Consequently, the inability to accurately date the benthic record of earlier terminations constitutes perhaps the single greatest obstacle to unraveling the problem of Late Pleistocene glaciations..
Obliquity is clearly very important during the Early Pleistocene, and recently a compelling argument was advanced that Late Pleistocene terminations are also forced by obliquity but that they bridge multiple obliquity cycles. Under this model, predominantly obliquity-driven total summer energy is considered more important in forcing terminations than the classical precession-based peak summer insolation model, primarily because the length of summer decreases as the Earth moves closer to the Sun. Hence, increased insolation intensity resulting from precession is offset by the shorter summer duration, with virtually no net effect on total summer energy in the high latitudes. By contrast, larger angles of Earth tilt lead to more positive degree days in both hemispheres at high latitudes, which can have a more profound effect on the total summer energy received and can act essentially independently from a given precession phase. The effect of obliquity on total summer energy is more persistent at large tilt angles, lasting up to 10 ky, because of the relatively long period of obliquity. Lastly, in a given year the influence of maximum obliquity persists for the whole summer, whereas at maximum precession early summer positive insolation anomalies are cancelled out by late summer negative anomalies, limiting the effect of precession over the whole summer. Although the precise three-cycle offset between T-I and T-II in our radiometric chronology and the phase relationships shown in Fig. 3 together argue strongly for obliquity forcing, the question remains whether obliquity changes alone are responsible. Recent work invoked an “insolation-canon,” whereby terminations are Southern Hemisphere–led but only triggered at times when insolation in both hemispheres is increasing simultaneously, with SHSI approaching maximum and NHSI just beyond a minimum. However, it is not clear that relatively low values of NHSI (at times of high SHSI) should play a role in deglaciation. An alternative is an insolation canon involving SHSI and obliquity. Note 6 – There are a number of papers based on Dongge and Hulu caves in China that have similar data and conclusions but I am still trying to understand them. 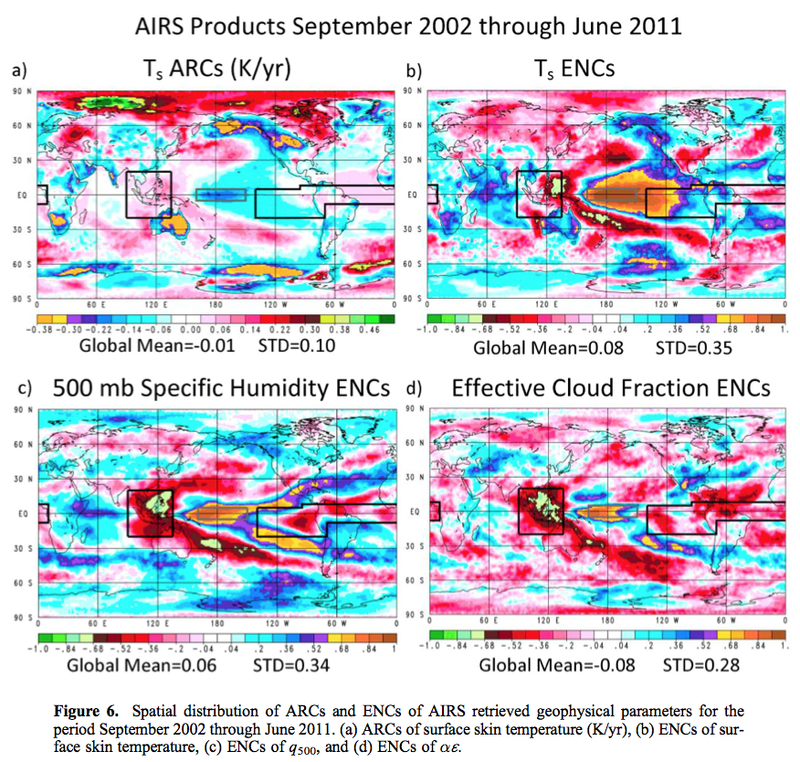 They attempt to tease out the relationship between δ18O and the monsoonal conditions and it’s involved. These papers include: Kelly et al 2006, High resolution characterization of the Asian Monsoon between 146,000 and 99,000 years B.P. 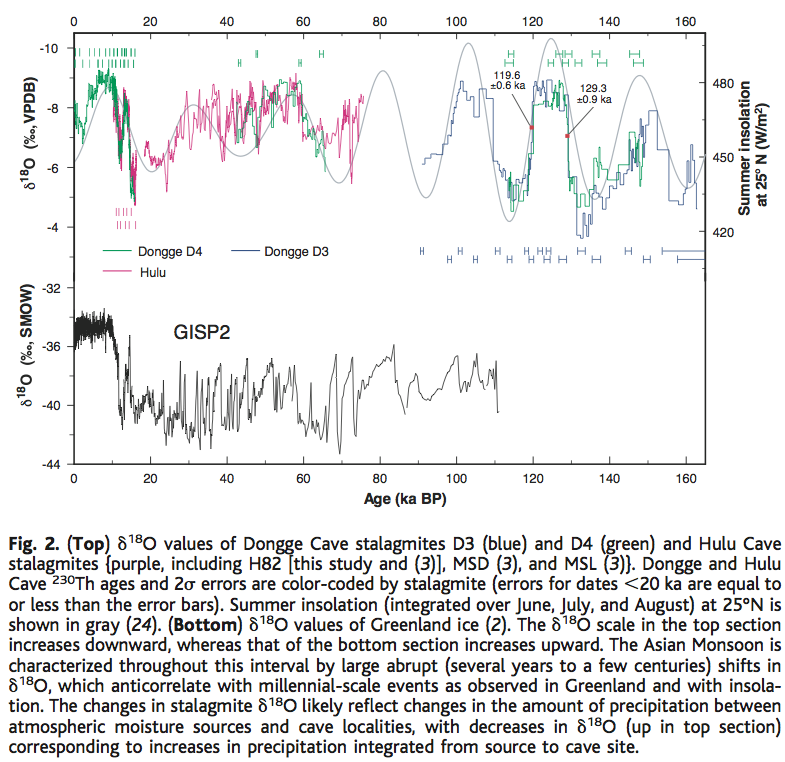 from Dongge Cave, China and global correlation of events surrounding Termination II; Wang et al 2008, Millennial- and orbital-scale changes in the East Asian monsoon over the past 224,000 years. In the recent articles we mostly reviewed climate models’ successes or otherwise with simulating the last glacial inception. Part Seven looked at some early GCM work – late 80′s to mid 90′s. Part Eight reviewed four different studies a decade or so ago. 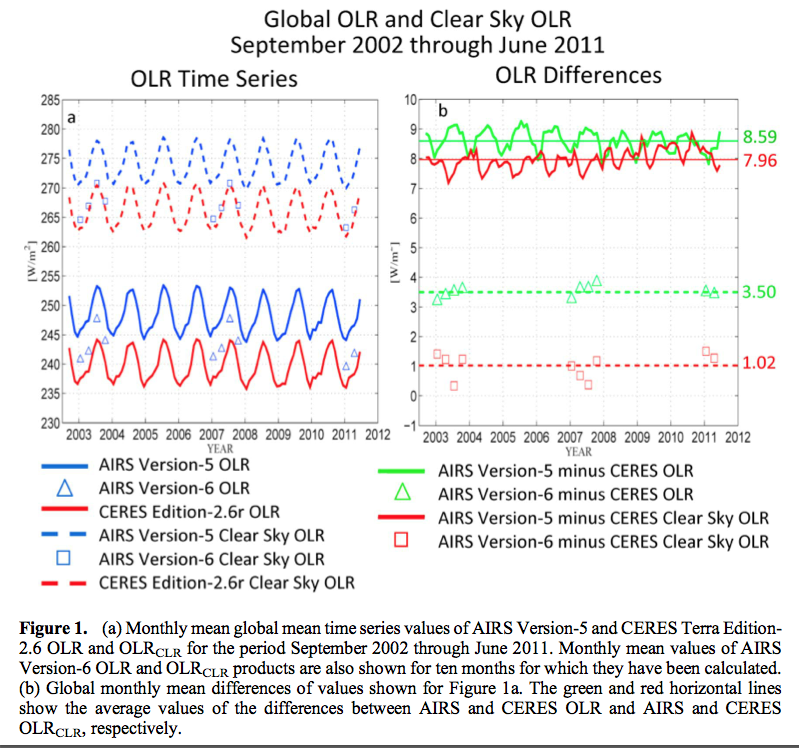 Part Nine was on one study which simulated the last 120 kyrs, and Part Ten reviewed one of the most recent studies of glacial inception 115 kyrs ago with a very latest climate model, CCSM4. We will return to glacial inception, but in this article we will look at the end of the last ice age, partly because on another blog someone highlighted a particular paper which covered it and I spent some time trying to understand the paper. The last 20 kyrs now have some excellent records from both polar regions. The EPICA project, initiated almost 20 years ago, has produced ice core data for Antarctica to match up with the Greenland NGRIP ice core data going back almost 800 kyrs. And from other research more proxy temperature data has become available from around the globe. This paper is from Shakun et al 2012 (thanks to commenter BBD for highlighting it). As an aside, Bette Otto-Bliesner is one of the co-authors, also for Jochum et al (2012) that we reviewed in Part Ten. She is one of the lead authors of the IPCC AR5 for the section on Paleoclimate. The Last Glacial Maximum (LGM) was around 22k-18 kyrs ago. Sea level was 120m lower than today as thick ice sheets covered parts of North America and Europe. Why did it end? How did it end? The paper really addresses the second question. 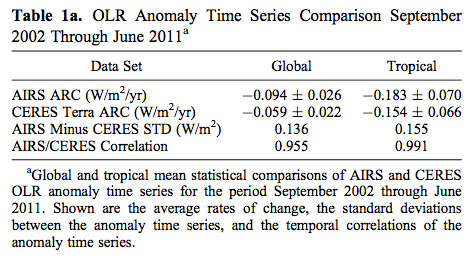 The second graph shows us the histogram of leads and lags vs CO2 changes for both Antarctica and global temperature. We can see clearly that the Antarctic temperatures started a sustained increase about 18 kyrs ago and led the global temperatures. 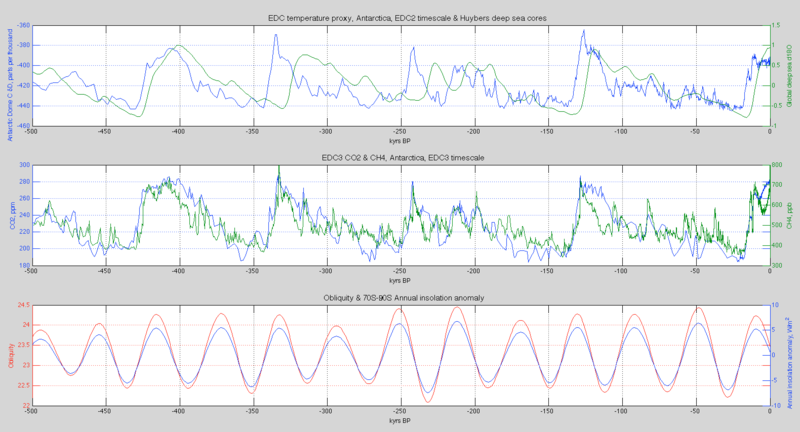 We can see that CO2 is slightly preceded by, or in sync with, Antarctic temperatures. This indicates that the CO2 increases here are providing a positive feedback on an initial Antarctic temperature rise (knowing from basic physics that more CO2 increases radiative forcing in the troposphere – see note 1). ..An important exception is the onset of deglaciation, which features about 0.3ºC of global warming before the initial increase in CO2 ,17.5 kyr ago. 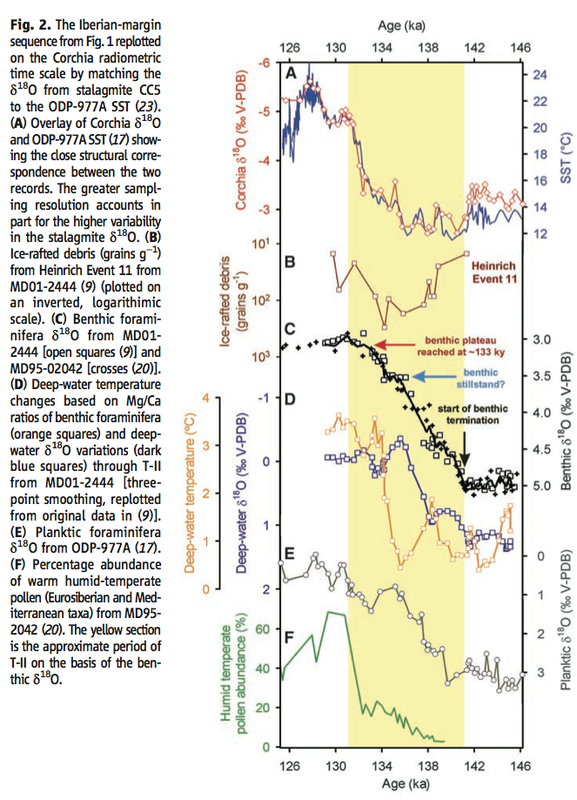 This finding suggests that CO2 was not the cause of initial warming. ..Substantial temperature change at all latitudes (Fig. 5b), as well as a net global warming of about 0.3ºC (Fig. 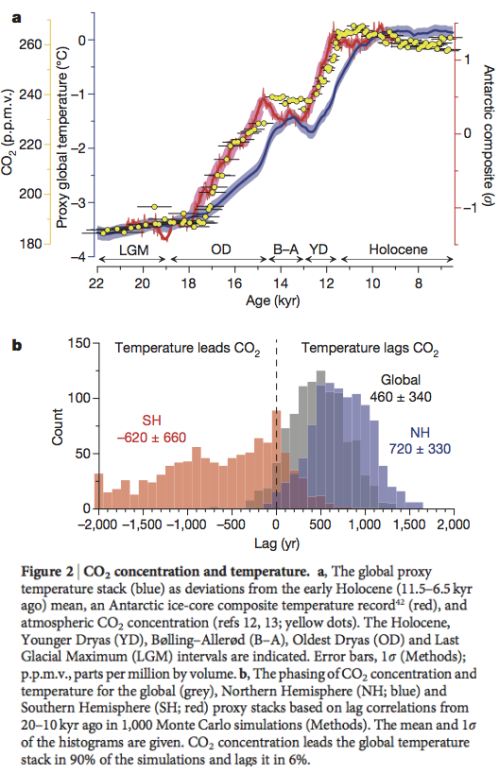 2a), precedes the initial increase in CO2 concentration at 17.5 kyr ago, suggesting that CO2 did not initiate deglacial warming. This early global warming occurs in two phases: a gradual increase between 21.5 and 19 kyr ago followed by a somewhat steeper increase between 19 and 17.5 kyr ago (Fig. 2a). The first increase is associated with mean warming of the northern mid to high latitudes, most prominently in Greenland, as there is little change occurring elsewhere at this time (Fig. 5 and Supplementary Fig. 20). The second increase occurs during a pronounced interhemispheric seesaw event (Fig. 5), presumably related to a reduction in AMOC strength, as seen in the Pa/Th record and our modelling (Fig. 4f, g). 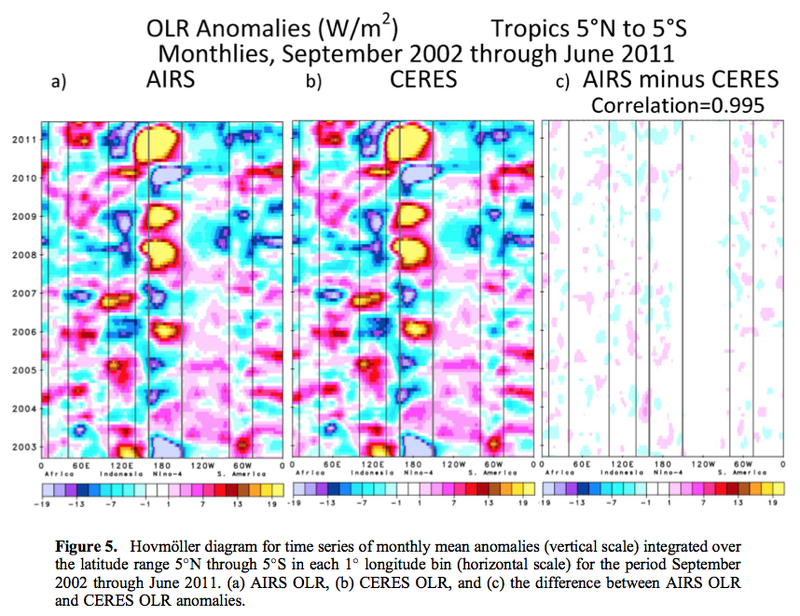 ..In any event, we suggest that these spatiotemporal patterns of temperature change are consistent with warming at northern mid to high latitudes, leading to a reduction in the AMOC at ~19 kyr ago, being the trigger for the global deglacial warming that followed, although more records will be required to confirm the extent and magnitude of early warming at such latitudes. 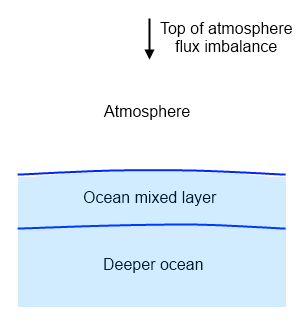 The interhemispheric seesaw referred to is important to understand and refers to the relationship between two large scale ocean currents – between the tropics and the high northern latitudes and between the tropics and Antartica. (A good paper to start is Asynchrony of Antarctic and Greenland climate change during the last glacial period, Blunier et al 1998). Perhaps a subject for a later article. A possible forcing model to explain this sequence of events starts with rising boreal summer insolation driving northern warming. This leads to the observed retreat of Northern Hemisphere ice sheets and the increase in sea level commencing, 19 kyr ago (Fig. 3a, b), with the attendant freshwater forcing causing a reduction in the AMOC that warms the Southern Hemisphere through the bipolar seesaw. Their model runs, fig 4c, don’t support this hypothesis – they show NH temperatures trending down over this critical period. 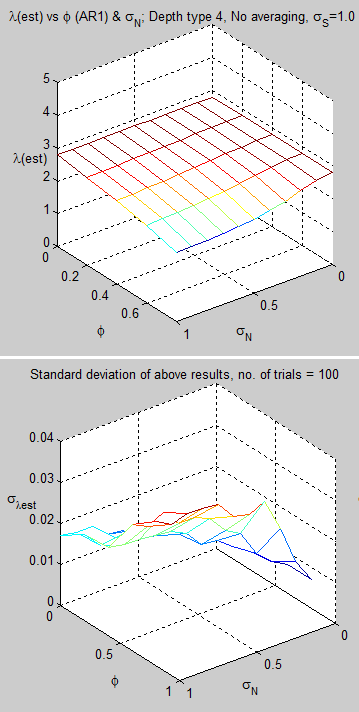 Compare 4b and 4c (b is proxy data, c is the model). However, they don’t break out the higher latitudes so perhaps their model did show this result. We saw this in Ghosts of Climates Past – Pop Quiz: End of An Ice Age. And also earlier periods of significant temperature rises in the high northern latitudes have been recorded during the last glacial period. Why were none of these able to initiate this same sequence of events and initiate an Antarctic temperature rise? At the time of the LGM, the ice sheets were at their furthest extent, with the consequent positive feedback of the higher albedo. If a small increase in summer insolation in high northern latitudes could initiate a deglaciation, surely the much higher summer insolation at 100 kyrs BP or 82 kyrs BP would have initiated a deglaciation given the additional benefit of the lower albedo at the time. As I was completing this section of the article I went back to the Nature website to see if there was any supplemental information (Nature papers are short and online material that doesn’t appear in the pdf paper can be very useful). There was a link to a News & Views article on this paper by Eric Wolff. Eric Wolff is one of the key EPICA contributors, a lead author and co-author of many EPICA papers, so I was quite encouraged to read his perspective on the paper. On page 49 of this issue, Shakun et al use a global reconstruction of temperature to show that the transition from the glacial period to the current interglacial consisted of an antiphased temperature response of Earth’s two hemispheres, superimposed on a globally coherent warming. Ocean-circulation changes, controlling the contrasting response in each hemisphere, seem to have been crucial to the glacial termination. Once again, a key climate scientist notes that we don’t know why the last ice age ended. As we saw in Part Six – “Hypotheses Abound” – the title explains the content.. ..Some studies have proposed that changes in ocean heat transport are an essential part of glacial termination. Shakun et al. combine their data with simulations based on an ocean–atmosphere general circulation model to present a plausible sequence of events from about 19,000 years ago onwards. They propose that a reduction in the AMOC (induced in the model by introducing fresh water into the North Atlantic) led to Southern Hemisphere warming, and a net cooling in the Northern Hemisphere. Carbon dioxide concentration began to rise soon afterwards, probably owing to degassing from the deep Southern Ocean; although quite well documented, the exact combination of mechanisms for this rise remains a subject of debate. Both hemispheres then warmed together, largely in response to the rise in carbon dioxide, but with further oscillations in the hemispheric contrast as the strength of the AMOC varied. The model reproduces well both the magnitude and the pattern of global and hemispheric change, with carbon dioxide and changing AMOC as crucial components. The success of the model used by Shakun and colleagues in reproducing the data is encouraging. 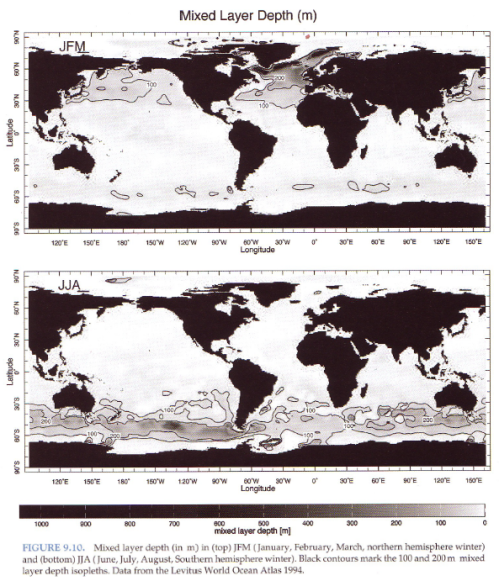 But one caveat is that the magnitude of fresh water injected into the Atlantic Ocean in the model was tuned to produce the inferred strength of the AMOC and the magnitude of interhemispheric climate response; the result does not imply that the ocean circulation in the model has the correct sensitivity to the volume of freshwater input. Shakun and colleagues’ work does provide a firm data-driven basis for a plausible chain of events for most of the last termination. But what drove the reduction in the AMOC 19,000 years ago? The authors point out that there was a significant rise in temperature between 21,500 and 19,000 years ago in the northernmost latitude band (60–90° N). They propose that this may have resulted from a rise in summer insolation (incoming solar energy) at high northern latitudes, driven by well-known cycles in Earth’s orbit around the Sun. They argue that this rise could have caused an initial ice-sheet melt that drove the subsequent reduction in the AMOC. However, this proposal needs to be treated with caution. First, there are few temperature records in this latitude band: the warming is seen clearly only in Greenland ice cores. Second, there is at least one comparable rise in temperature in the Greenland records, between about 62,000 and 60,000 years ago, which did not result in a termination. Finally, although it is true that northern summer insolation increased from 21,500 to 19,000 years ago, its absolute magnitude remained lower than at any time between 65,000 and 30,000 years ago. It is not clear why an increase in insolation from a low value initiated termination whereas a continuous period of higher insolation did not. In short, another ingredient is needed to explain the link between insolation and termination, and the triggers for the series of events described so well in Shakun and colleagues’ paper. The see-saw of temperature between north and south throughout the glacial period, most clearly observed in rapid Greenland warmings (Dansgaard–Oeschger events), is often taken as a sign that numerous changes in AMOC strength occurred. However, the AMOC weakening that started 19,000 years ago lasted for much longer than previous ones, allowing a much more substantial rise in southern temperature and in carbon dioxide concentration. 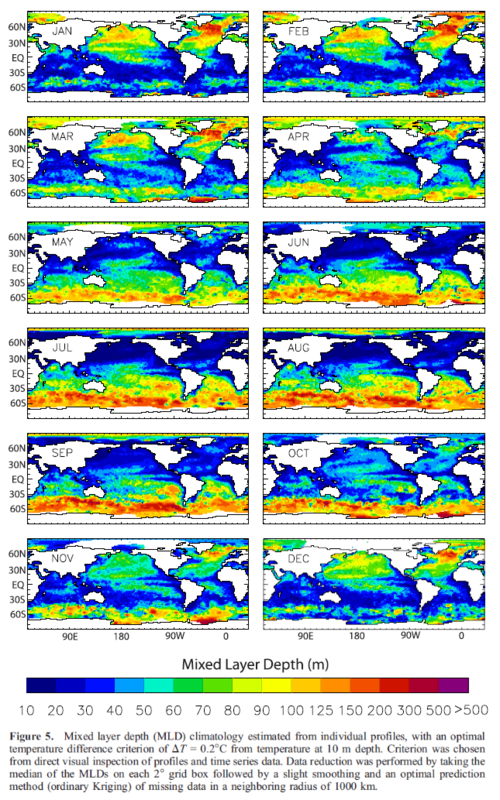 Why was it so hard, at that time, to reinvigorate the AMOC and end this weakening? And what is the missing ingredient that turned the rise in northern insolation around 20,000 years ago into the starting gun for deglaciation, when higher insolation at earlier times failed to do so? It has been proposed that terminations occur only when northern ice-sheet extent is particularly large. If this is indeed the extra ingredient, then the next step in unwinding the causal chain must be to understand what aspect of a large ice sheet controls the onset and persistence of changes in the AMOC that seem to have been key to the last deglaciation. Thanks, Eric Wolff. My summary on Shakun et al, overall – on its main subject – it’s a very good paper with solid new data, good explanations and graphs. However, this field is still in flux..
Understanding the role of atmospheric CO2 during past climate changes requires clear knowledge of how it varies in time relative to temperature. Antarctic ice cores preserve highly resolved records of atmospheric CO2 and Antarctic temperature for the past 800,000 years. Here we propose a revised relative age scale for the concentration of atmospheric CO2 and Antarctic temperature for the last deglacial warming, using data from five Antarctic ice cores. We infer the phasing between CO2 concentration and Antarctic temperature at four times when their trends change abruptly. We find no significant asynchrony between them, indicating that Antarctic temperature did not begin to rise hundreds of years before the concentration of atmospheric CO2, as has been suggested by earlier studies. Ouch. In a later article we will delve into the complex world of dating ice cores and the air trapped in the ice cores. The cause of warming in the Southern Hemisphere during the most recent deglaciation remains a matter of debate. Hypotheses for a Northern Hemisphere trigger, through oceanic redistributions of heat, are based in part on the abrupt onset of warming seen in East Antarctic ice cores and dated to 18,000 years ago, which is several thousand years after high-latitude Northern Hemisphere summer insolation intensity began increasing from its minimum, approximately 24,000 years ago. An alternative explanation is that local solar insolation changes cause the Southern Hemisphere to warm independently. Here we present results from a new, annually resolved ice-core record from West Antarctica that reconciles these two views. The records show that 18,000 years ago snow accumulation in West Antarctica began increasing, coincident with increasing carbon dioxide concentrations, warming in East Antarctica and cooling in the Northern Hemisphere associated with an abrupt decrease in Atlantic meridional overturning circulation. However, significant warming in West Antarctica began at least 2,000 years earlier. Circum-Antarctic sea-ice decline, driven by increasing local insolation, is the likely cause of this warming. The marine-influenced West Antarctic records suggest a more active role for the Southern Ocean in the onset of deglaciation than is inferred from ice cores in the East Antarctic interior, which are largely isolated from sea-ice changes. We see that “rising solar insolation” in any part of the world from any value can be presented as a hypothesis for ice age termination. Here “local solar insolation” means the solar insolation in the Antarctic region, compare with Shakun et al, where rising insolation (from a very low value) in the high northern latitudes was presented as a hypothesis for northern warming which then initiated a southern warming. Because the climate of West Antarctica is distinct from that of interior East Antarctica, the exclusion of West Antarctic records may result in an incomplete picture of past Antarctic and Southern Ocean climate change. Interior West Antarctica is lower in elevation and more subject to the influence of marine air masses than interior East Antarctica, which is surrounded by a steep topographic slope. Marine-influenced locations are important because they more directly reflect atmospheric conditions resulting from changes in ocean circulation and sea ice. However, ice-core records from coastal sites are often difficult to interpret because of complicated ice-flow and elevation histories. The West Antarctic Ice Sheet (WAIS) Divide ice core (WDC), in central West Antarctica, is unique in coming from a location that has experienced minimal elevation change, is strongly influenced by marine conditions and has a relatively high snow-accumulation rate, making it possible to obtain an accurately dated record with high temporal resolution. 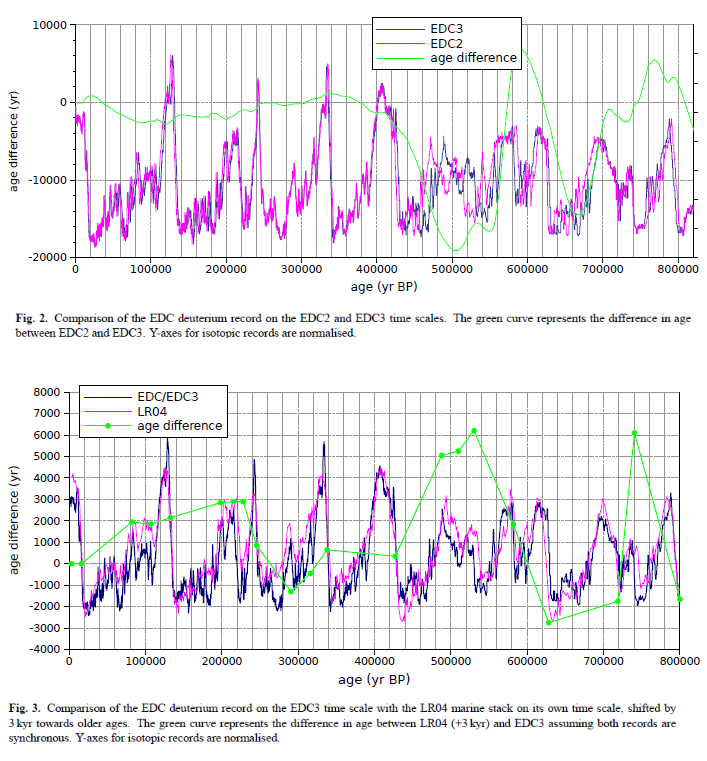 ..and significant warming at WDC began by 20 kyr ago, at least 2,000 yr before significant warming at EDML and EDC. 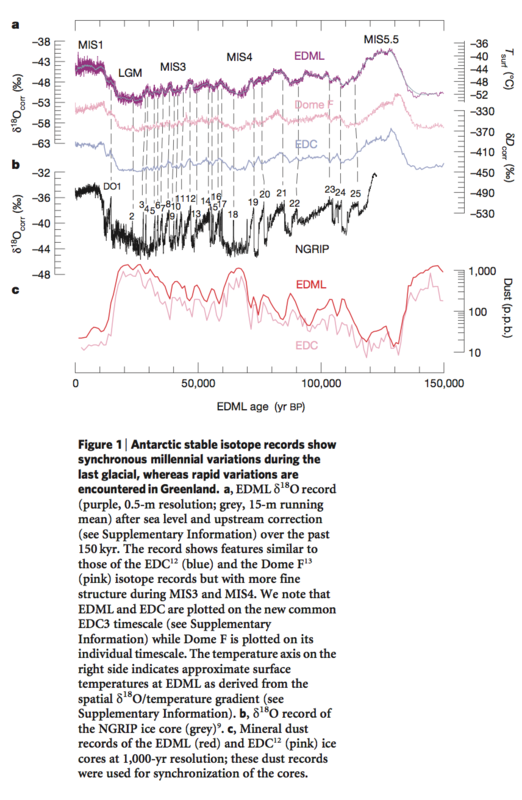 ..Both the WDC and the lower-resolution Byrd ice-core records show that warming in West Antarctica began before the decrease in AMOC that has been invoked to explain Southern Hemisphere warming [the references include Shakun et al 2012]. The most significant early warming at WDC occurred between 20 and 18.8 kyr ago, although a period of significant warming also occurred between 22 and 21.5 kyr ago. The magnitude of the warming at WDC before 18 kyr ago is much greater than at EDML or EDC..
We will look at this paper in more detail in a later article. The termination of the last ice age is a fascinating topic that tests our ability to understand climate change. One criticism made of climate science on many blogs is that climate scientists are obsessed with running GCMs, instead of doing “real science”, “running real experiments” and “gathering real data”. I can’t say where the balance really is, but in my own journey through climate science I find that there is a welcome and healthy obsession with gathering data, finding new sources of data, analyzing data, comparing datasets and running real experiments. The Greenland and Antarctic ice core projects, like NGRIP, EPICA and WAIS Divide Project are great examples. On other climate blogs, writers and commenters seem very happy that climate scientists have written a paper that “supports the orbital hypothesis” without any critical examination of what the paper actually supports with evidence. Returning to the question at hand, explaining the termination of the last ice age – the problem at the moment is less that there is no theory, and more that the wealth of data has not yet settled onto a clear chain of cause and effect. This is obviously essential to come up with a decent theory. And any theory that explains the termination of the last ice age will need to explain why it didn’t happen earlier. Invoking “rising insolation” seems like lazy journalism to me. Luckily Eric Wolff, at least, agrees with me. For interest Valérie Masson-Delmotte is one of the two co-ordinating lead authors for AR5 for the Paleoclimate section, Frédéric Parrenin is a contributing author. Note 1 – see for example, CO2 – An Insignificant Trace Gas? – an 8-part series on CO2, Atmospheric Radiation and the “Greenhouse” Effect – a 12-part series on how radiation interacts with the atmosphere, Visualizing Atmospheric Radiation – a 13-part series to help us get a better grasp of how this works including “does water vapor overwhelm CO2″, “is CO2 saturated” and many other questions. I don’t think this is a simple topic. Can we measure the top of atmosphere (TOA) radiative changes and the surface temperature changes and derive the “climate sensivity” from the relationship between the two parameters? First, what do we mean by “climate sensitivity”? In simple terms this parameter should tell us how much more radiation (“flux”) escapes to space for each 1°C increase in surface temperature. Climate sensitivity is all about trying to discover whether the climate system has positive or negative feedback. If the average surface temperature of the earth increased by 1°C and the radiation to space consequently increased by 3.3 W/m², this would be approximately “zero feedback”. Why is this zero feedback? If somehow the average temperature of the surface of the planet increased by 1°C – say due to increased solar radiation – then as a result we would expect a higher flux into space. A hotter planet should radiate more. If the increase in flux = 3.3 W/m² it would indicate that there was no negative or positive feedback from this solar forcing (note 1). Suppose the flux increased by 0. That is, the planet heated up but there was no increase in energy radiated to space. That would be positive feedback within the climate system – because there would be nothing to “rein in” the increase in temperature. Suppose the flux increased by 5 W/m². In this case it would indicate negative feedback within the climate system. The key value is the “benchmark” no feedback value of 3.3 W/m². If the value is above this, it’s negative feedback. If the value is below this, it’s positive feedback. Essentially, the higher the radiation to space as a result of a temperature increase the more the planet is able to “damp out” temperature changes that are forced via solar radiation, or due to increases in inappropriately-named “greenhouse” gases. Consider the extreme case where as the planet warms up it actually radiates less energy to space – clearly this will lead to runaway temperature increases (less energy radiated means more energy absorbed, which increased temperatures, which leads to even less energy radiated..). As a result we measure sensitivity as W/m².K which we read as Watts per meter squared per Kelvin” – and 1K change is the same as 1°C change. In many subjects, researchers’ algebra converges on conventional usage, but in the realm of climate sensitivity everyone has apparently adopted their own. As a note for non-mathematicians, there is nothing inherently wrong with this, but it just makes each paper confusing especially for newcomers and probably for everyone. I mostly adopt the Spencer & Braswell 2008 terminology in this article (see reference and free link below). I do change their α (climate sensitivity) into λ (which everyone else uses for this value) mainly because I had already produced a number of graphs with λ before starting to write the article..
C.∂T/∂t = F + S …. What does this equation say? – this is a simple statement of energy conservation, the first law of thermodynamics. 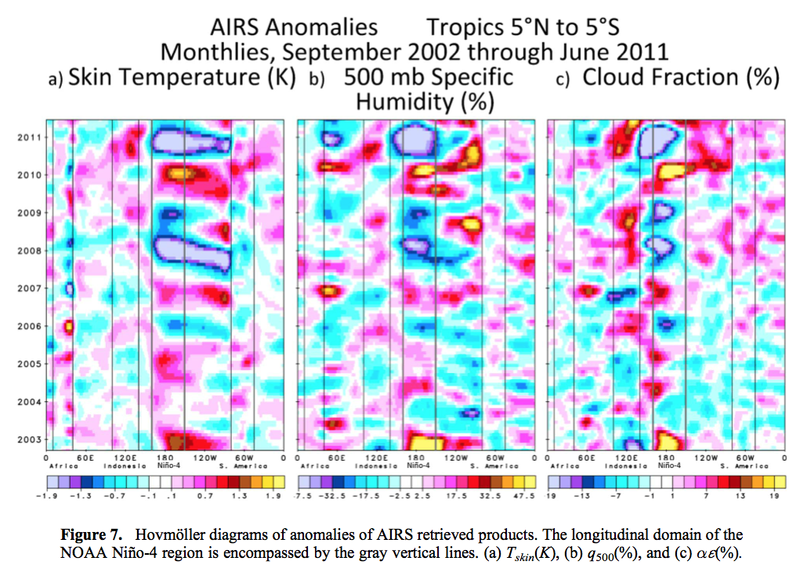 The TOA radiative flux anomaly, F, is a value we can measure using satellites. T is average surface temperature, which is measured around the planet on a frequent basis. But S is something we can’t measure. What is F made up of? where N = random fluctuations in radiative flux, f = “forcings”, and λT is the all important climate response or feedback. The forcing f is, for the purposes of this exercise, defined as something added into the system which we believe we can understand and estimate or measure. This could be solar increases/decreases, it could be the long term increase in the “greenhouse” effect due to CO2, methane and other gases. For the purposes of this exercise it is not feedback. Feedback includes clouds and water vapor and other climate responses like changing lapse rates (atmospheric temperature profiles), all of which combine to produce a change in radiative output at TOA. And an important point is that for the purposes of this theoretical exercise, we can remove f from the measurements because we believe we know what it is at any given time. N is an important element. Effectively it describes the variations in TOA radiative flux due to the random climatic variations over many different timescales. The climate sensitivity is the value λT, where λ is the value we want to find. C.∂T/∂t = – λT + N + S …. If we plot F (measured TOA flux) vs T we can estimate λ from the slope of the least squares regression. λ (est) = Cov[F,T] / Var[T] …. This oft-cited paper (reference and free link below) calculates the climate sensitivity from 1985-1996 using measured ERBE data at 2.3 ± 1.3 W/m².K. Their result indicates positive feedback, or at least, a range of values which sit mainly in the positive feedback space. 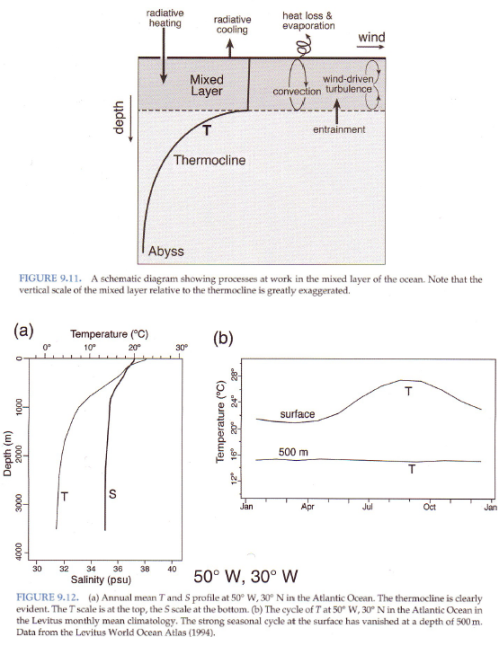 This equation includes a term that allows F to vary independently of surface temperature.. If we regress (- λT+ N) against T, we should be able to obtain a value for λ. The N terms are likely to contaminate the result for short datasets, but provided the N terms are uncorrelated to T, the regression should give the correct value for λ, if the dataset is long enough..
[Terms changed to SB2008 for easier comparison, and emphasis added]. Like Spencer & Braswell, I created a simple model to demonstrate why measured results might deviate from the actual climate sensitivity. 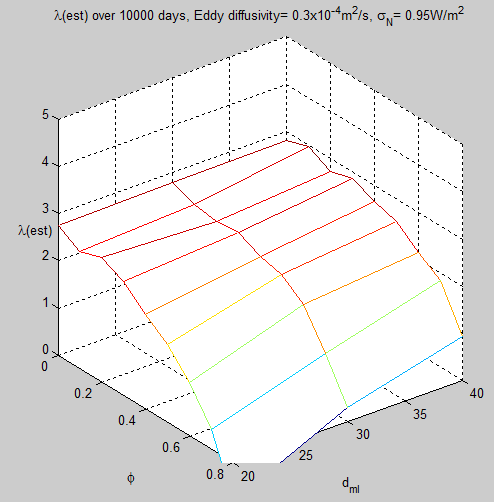 In this model, the climate sensitivity, λ = 3.0 W/m².K. 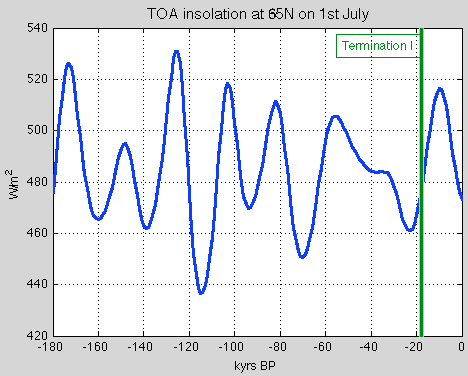 In some cases the regression is done with the daily values, and in other cases the regression is done with averaged values of temperature and TOA radiation across time periods of 7, 30 & 90 days. 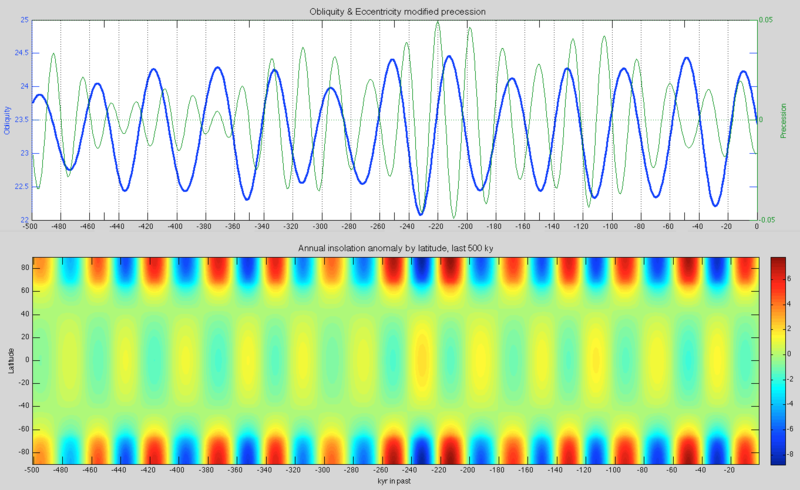 I also put a 30-day low pass filter on the daily radiative noise in one case (before “injecting” into the model). Some results are based on 10,000 days (about 30 years), with 100,000 days (300 years) as a separate comparison. 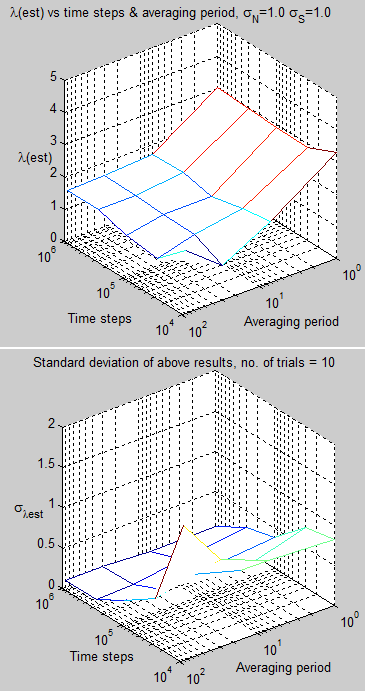 In each case the estimated value of λ is calculated from the mean of 100 simulation results. 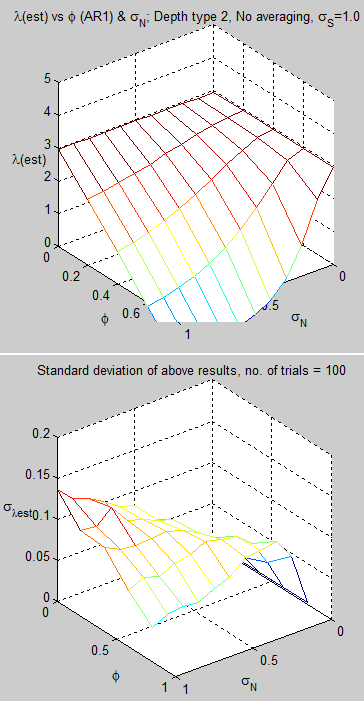 The 2nd graph shows the standard deviation σλ, of these simulation results which is a useful guide to the likely spread of measured results of λ (if the massive oversimplifications within the model were true). 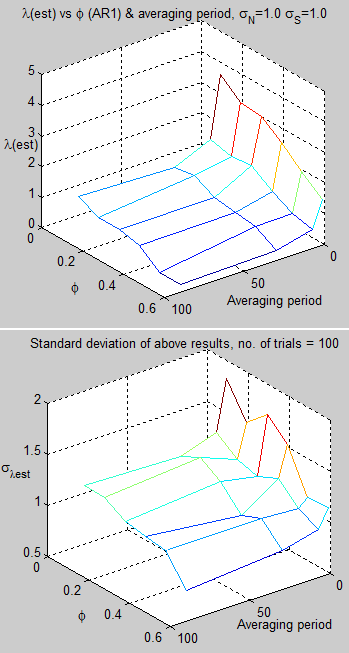 The vertical axis (for the estimate of λ) is the same in each graph for easier comparison, while the vertical axis for the standard deviation changes according to the results due to the large changes in this value. If we consider first the changes in the standard deviation of the estimated value of climate sensitivity we can see that the spread in the results is much higher in each case when we consider 30 years of data vs 300 years of data. This is to be expected. However, given that in the 30-year cases σλ is similar in magnitude to λ we can see that doing one estimate and relying on the result is problematic. This of course is what is actually done with measurements from satellites where we have 30 years of history. Second, we can see that mostly the estimates of λ tend to be lower than the actual value of 3.0 W/m².K. The reason is quite simple and is explained mathematically in the next section which non-mathematically inclined readers can skip. In essence, it is related to the idea in the quote from Forster & Gregory. If the radiative flux noise is uncorrelated to temperature then the estimates of λ will be unbiased. By the way, remember that by “noise” we don’t mean instrument noise, although that will certainly be present. We mean the random fluctuations due to the chaotic nature of weather and climate. If we refer back to Figure 1 we can see that when the averaging period = 1, the estimates of climate sensitivity are equal to 3.0. In this case, the noise is uncorrelated to the temperature because of the model construction. Slightly oversimplifying, today’s temperature is calculated from yesterday’s noise. Today’s noise is a random number unrelated to yesterday’s noise. Therefore, no correlation between today’s temperature and today’s noise. As soon as we average the daily data into monthly results which we use to calculate the regression then we have introduced the fact that monthly temperature is correlated to monthly radiative flux noise (note 3). This is also why Figures 8 & 9 show a low bias for λ even with no averaging of daily results. 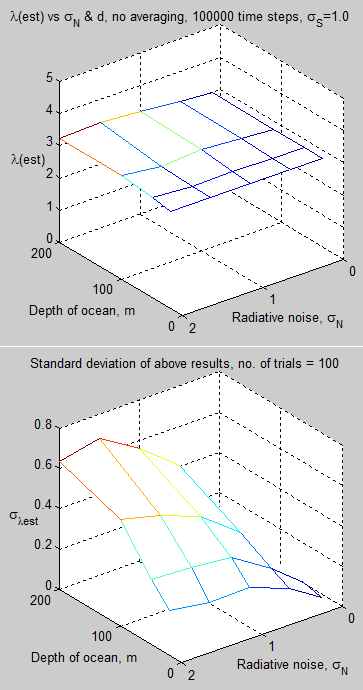 These figures are calculated with autocorrelation for radiative flux noise. This means that past values of flux are correlated to current vales – and so once again, daily temperature will be correlated with daily flux noise. 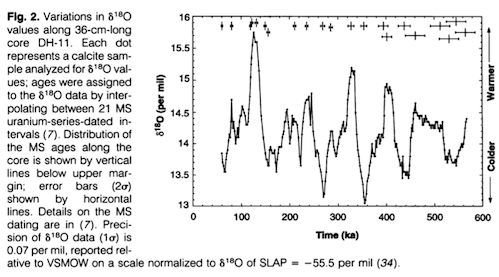 This is also the case where low pass filtering is used to create the radiative noise data (as in Figures 6 & 7). x = Cov[- λT + N, T] / Var[T] …. 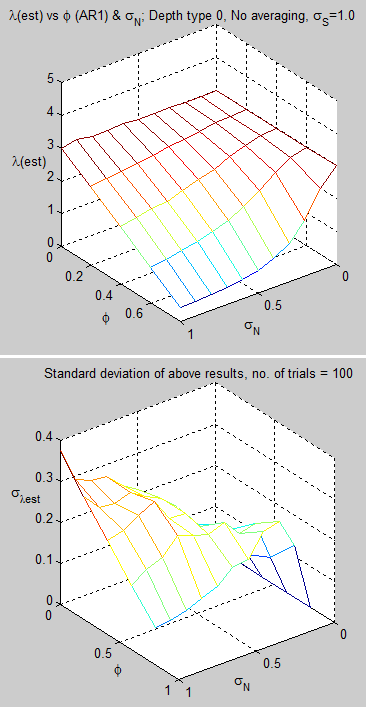 And we see that the regression of the line is always biased if N is correlated with T. If the expected value of N = 0 the last term in the top part of the equation drops out, but E[NT] ≠ 0 unless N is uncorrelated with T.
Note of course that we will use the negative of the slope of the line to estimate λ, and so estimates of λ will be biased low. 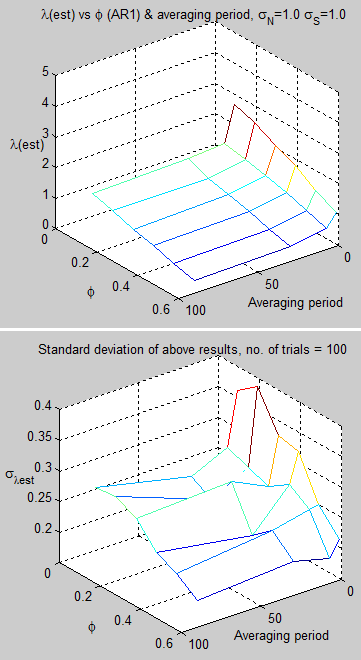 As a note for the interested student, why is it that some of the results show λ > 3.0? 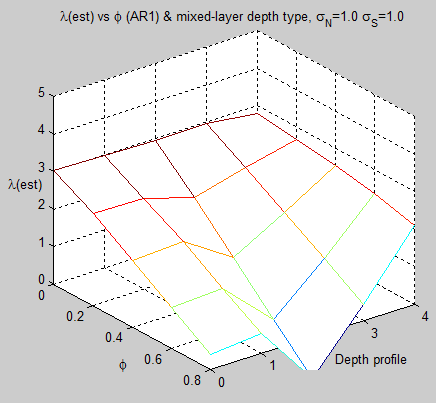 The value ba on the vertical axis is a normalized error term (rather than the estimate of λ). The relationship between global-mean radiative forcing and global-mean climate response (temperature) is of intrinsic interest in its own right. A number of recent studies, for example, discuss some of the broad limitations of (1) and describe procedures for using it to estimate Q from GCM experiments (Hansen et al. 1997; Joshi et al. 2003; Gregory et al. 2004) and even procedures for estimating  from observations (Gregory et al. 2002). If we are to assume gross time–space averages to represent the effects of these processes, then the assumptions inherent to (1) certainly require a much more careful level of justification than has been given. At this time it is unclear as to the specific value of a global-mean sensitivity as a measure of feedback other than providing a compact and convenient measure of model-to-model differences to a fixed climate forcing (e.g., Fig. 1). Measuring the relationship between top of atmosphere radiation and temperature is clearly very important if we want to assess the all-important climate sensitivity. Spencer & Braswell have produced a very useful paper which demonstrates some obvious problems with deriving the value of climate sensitivity from measurements. Although I haven’t attempted to reproduce their actual results, I have done many other model simulations to demonstrate the same problem. Murphy & Forster have produced a paper which claims that the actual magnitude of the problem demonstrated by Spencer & Braswell is quite small in comparison to the real value being measured (as yet I can’t tell whether their claim is correct). The value called climate sensitivity might be a variable (i.e., not a constant value) and it might turn out to be much harder to measure than it really seems (and already it doesn’t seem easy). Note 1 – The reason why the “no feedback climate response” = 3.3 W/m².K is a little involved but is mostly due to the fact that the overall climate is radiating around 240 W/m² at TOA. Note 2 – This is effectively the same as saying f=0. If that seems alarming I note in advance that the exercise we are going through is a theoretical exercise to demonstrate that even if f=0, the regression calculation of climate sensitivity includes some error due to random fluctuations. Note 3 – If the model had one random number for last month’s noise which was used to calculate this month’s temperature then the monthly results would also be free of correlation between the temperature and radiative noise.